Bayside Presbyterian Church (then called Robbins Corner Chapel) held its first service in 1948 under the leadership and vision of the pastor of the East Ocean View Presbyterian Church, Reverend Gordon Riggan. Several monetary gifts, as well as a lot at the corner of Bradford and Rutherford Roads, allowed members to begin work on the construction of a concrete block building seen at right. Work on this building was slow, completed by volunteers, and only accomplished as funds became available. Attendance at the first service led by Rev Riggan was thirty-three. Rev Riggan left in 1949 and leadership passed to an elder, another pastor, and in 1951, Reverend S.K. Emurian, who was 77 years old when he accepted the call. In 1953, Robbins Corner Chapel organized as Bayside Presbyterian Church by the Commission appointed by Norfolk Presbytery. Shortly thereafter, Rev. Emurian returned to his evangelism work, and in 1955 Captain John E. Johnson, U.S. Navy Chaplain Ret., accepted the call to Bayside. Under his leadership, construction on the present church building began on five acres of land given by Norfolk Presbytery. The congregation moved into the building in 1963. By 1967 when Captain Johnny retired, membership was at 508. The Reverend Fletcher C. Hutcheson was called as pastor in 1967. He continued to build on the foundation laid by his predecessors, adding more classrooms to the building, calling an assistant pastor, a secretary and a sexton. It was during Rev Hutcheson's fourteen year tenure that our service to the community expanded. Rev. Hutcheson died unexpectedly in 1981; he was followed by an interim pastor, Rev. Susan Haugh, until Rev. Dr. Richard Keever accepted a call in September of 1982. Dr. Keever served Bayside for 27 years. During his tenure, a Director of Educational Ministries and a Director of Music Ministries were called, an administrative wing, a music wing, a youth activities wing, a new fellowship hall, an up-dated kitchen, and an expanded Sanctuary were added to the building. In addition, membership grew to over 1200. Upon Dr. Keever's retirement in 2008, several interim pastors served the Church until the current pastor, Rev. Dr. David Rollins accepted a call to Bayside in 2010. 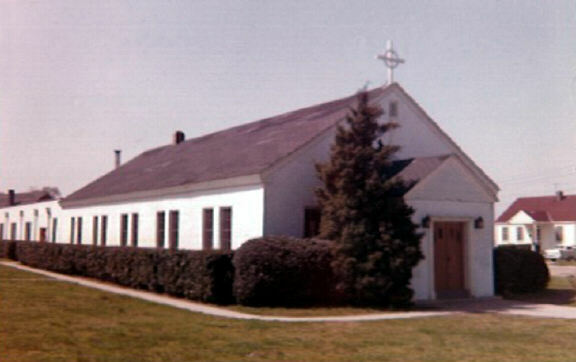 Our present church building, 1964-present. Click below to learn more about our church. Its pews will be filled, if I help to fill them. It will make generous gifts to causes, if I am a generous giver. It will bring other people into its worship and fellowship if I bring them.